Berkery, Noyes & Co. advises SCP Communications, Inc. on the divesture of its publishing subsidiaries (Cliggott Publishing and The Oncology Group) to United Business Media - Berkery, Noyes & Co., LLC. 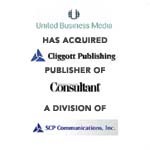 NEW YORK, November 3, 2003 — Joseph Berkery, President of Berkery, Noyes & Co., LLC, announced today that the firm represented SCP Communications, Inc. in its sale of its publishing subsidiaries (Cliggott Publishing and The Oncology Group) to United Business Media (NASDAQ: UNEWY). Cliggott Publishing is one of the foremost publishers of clinical journals and publication projects for primary care practitioners and medical and surgical specialists. Cliggott Publishing’s flagship publication, Consultant®, is the #1 independent journal for primary care physicians, physician assistants, and nurse practitioners, and is a powerful franchise in the market. The Oncology Group (formerly called PRR) is a leader in the field of oncology publishing, serving the broad audience of oncology physicians, hematology physicians, oncology nurses, specialists, researchers and other healthcare professionals dedicated to the diagnosis and treatment of all forms of cancer. The Oncology Group publishes the journals ONCOLOGY and Oncology News International two market-leading journals, both of which are advertising-supported with the mission of providing timely, accurate and original information covering all aspects of cancer research, prevention, diagnosis, treatment and patient care. UBM paid $37.5 million in cash for the two publishing groups. Berkery, Noyes specializes in investment banking for the information, publishing and communications industries. Among the most recent transactions completed by Berkery, Noyes are Reed Elsevier’s divesture of Marquis Who’s Who and certain National Register Publishing titles to WL Ross & Co., LLC, Pearson’s divestiture of Forum to Institute for International Research, ProQuest Company in its purchase of SIRS Publishing, Inc., National Physicians DataSource, Inc. (The Little Blue Book) on its Sale to WebMD Corp, Advanstar Communications’ acquisition of HT Magazine from Niche Publishing and Delta Education’s acquisition of Educators Publishing Service. Berkery, Noyes & Co., LLC clients range from small firms, often seeking an acquirer, to most of the major global information companies, who use the firm’s expertise in identifying, analyzing and negotiating with acquisition candidates, as well as in managing divestitures. The firm serves the information and publishing industry from offices in New York and Boston.